(Nanowerk News) Less than 1 percent of Earth's water is drinkable. Removing salt and other minerals from our biggest available source of water -- seawater -- may help satisfy a growing global population thirsty for fresh water for drinking, farming, transportation, heating, cooling and industry. But desalination is an energy-intensive process, which concerns those wanting to expand its application. 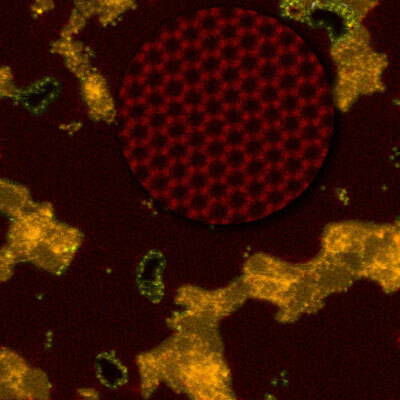 Now, a team of experimentalists led by the Department of Energy's Oak Ridge National Laboratory has demonstrated an energy-efficient desalination technology that uses a porous membrane made of strong, slim graphene--a carbon honeycomb one atom thick. The results are published in the March 23 advance online issue of Nature Nanotechnology ("Water Desalination Using Nanoporous Single-Layer Graphene"). "Our work is a proof of principle that demonstrates how you can desalinate saltwater using free-standing, porous graphene," said Shannon Mark Mahurin of ORNL's Chemical Sciences Division, who co-led the study with Ivan Vlassiouk in ORNL's Energy and Transportation Science Division. "It's a huge advance," said Vlassiouk, pointing out a wealth of water travels through the porous graphene membrane. "The flux through the current graphene membranes was at least an order of magnitude higher than [that through] state-of-the-art reverse osmosis polymeric membranes." Current methods for purifying water include distillation and reverse osmosis. Distillation, or heating a mixture to extract volatile components that condense, requires a significant amount of energy. Reverse osmosis, a more energy-efficient process that nonetheless requires a fair amount of energy, is the basis for the ORNL technology. Making pores in the graphene is key. Without these holes, water cannot travel from one side of the membrane to the other. The water molecules are simply too big to fit through graphene's fine mesh. But poke holes in the mesh that are just the right size, and water molecules can penetrate. Salt ions, in contrast, are larger than water molecules and cannot cross the membrane. The porous membrane allows osmosis, or passage of a fluid through a semipermeable membrane into a solution in which the solvent is more concentrated. "If you have saltwater on one side of a porous membrane and freshwater on the other, an osmotic pressure tends to bring the water back to the saltwater side. But if you overcome that, and you reverse that, and you push the water from the saltwater side to the freshwater side--that's the reverse osmosis process," Mahurin explained. Today reverse-osmosis filters are typically polymers. A filter is thin and resides on a support. It takes significant pressure to push water from the saltwater side to the freshwater side. "If you can make the membrane more porous and thinner, you can increase the flux through the membrane and reduce the pressure requirements, within limits," Mahurin said. "That all serves to reduce the amount of energy that it takes to drive the process." Graphene to the rescue Graphene is only one-atom thick, yet flexible and strong. Its mechanical and chemical stabilities make it promising in membranes for separations. A porous graphene membrane could be more permeable than a polymer membrane, so separated water would drive faster through the membrane under the same conditions, the scientists reasoned. "If we can use this single layer of graphene, we could then increase the flux and reduce the membrane area to accomplish that same purification process," Mahurin said. To make graphene for the membrane, the researchers flowed methane through a tube furnace at 1,000 degrees C over a copper foil that catalyzed its decomposition into carbon and hydrogen. The chemical vapor deposited carbon atoms that self-assembled into adjoining hexagons to form a sheet one atom thick. The researchers transferred the graphene membrane to a silicon nitride support with a micrometer-sized hole. Then the team exposed the graphene to an oxygen plasma that knocked carbon atoms out of the graphene's nanoscale chicken wire lattice to create pores. The longer the graphene membrane was exposed to the plasma, the bigger the pores that formed, and the more made. The prepared membrane separated two water solutions--salty water on one side, fresh on the other. The silicon nitride chip held the graphene membrane in place while water flowed through it from one chamber to the other. The membrane allowed rapid transport of water through the membrane and rejected nearly 100 percent of the salt ions, e.g., positively charged sodium atoms and negatively charged chloride atoms. To figure out the best pore size for desalination, the researchers relied on the Center for Nanophase Materials Sciences (CNMS), a DOE Office of Science User Facility at ORNL. There, aberration-corrected scanning transmission electron microscopy (STEM) imaging, led by Raymond Unocic, allowed for atom-resolution imaging of graphene, which the scientists used to correlate the porosity of the graphene membrane with transport properties. They determined the optimum pore size for effective desalination was 0.5 to 1 nanometers, Mahurin said. They also found the optimal density of pores for desalination was one pore for every 100 square nanometers. "The more pores you get, the better, up to a point until you start to degrade any mechanical stability," Mahurin said. Vlassiouk said making the porous graphene membranes used in the experiment is viable on an industrial scale, and other methods of production of the pores can be explored. "Various approaches have been tried, including irradiation with electrons and ions, but none of them worked. So far, the oxygen plasma approach worked the best," he added. He worries more about gremlins that plague today's reverse osmosis membranes--growths on membrane surfaces that clog them (called "biofouling") and ensuring the mechanical stability of a membrane under pressure.